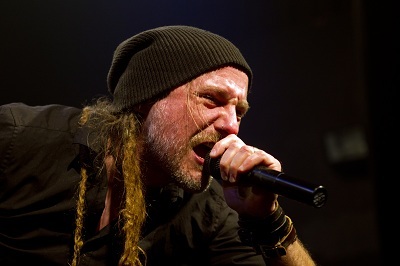 I briefly spoke to Merlin and Chrigel from Eluveitie shortly before they played the HMV Forum in London as part of their tour with Sabaton, and asked them about their albums and touring..
Festivalphoto: Your new album, Helvetios was released in February. How has it been going down with the fans? Chrigel: It's going down great, reactions have been extremely positive. Festivalphoto: 6 months after Helvetios you released the early years. What made you decide to go back and re-record your first EP (Ven) and release it with a remastered version of Spirit, as the early years? Chrigel: On one hand both havent been available for quite a while so it made sense to re-release them, and also we're celebrating our tenth anniversary this year we wanted to do something special for the fans. It's not a regular album, it's a special. Merlin: Chrigel here is the main song writer. The rest of us, some more, some less. I think Ivo and Anna he mainly works with them, but it's Chrigel that's the concept guy. Chrigel: Once a song is roughly written in it's concept, each musician works out his or her own lines for the specific instruments. Chrigel: It's basically history. What we are doing lyrically is narration of history. Festivalphoto: You're on tour with Sabaton at the moment and have dates up to the end of December then a break till March when you have a very busy month. Merlin: We're actually working on filling the gap already. The tour is scheduled to go on till the middle of next year I think. We hope to cover much of the world. Festivalphoto: Is touring with a band of 8 members difficult? Do you find it hard to fit everyone on stage in some of the smaller venues? Merlin: Yes, I think we just broke our record for fitting on the smallest stage ever, when was that..
Merlin: Two days ago in Belfast. Chrigel: Luckily we don't play small stages that often any more, but especially on a tour like this where you're playing places you haven't played before - like Belfast two days ago, of course the stages are pretty small, but we can always make it work. Festivalphoto: It must make eveything more difficult - more people, more equipment to transport..
Chrigel: It's more of everything with us, but it's worth it. A big part of our show is an abundance of instruments and people to play them. Festivalphoto: Are you likely to be playing any festivals next year? Merlin: Sure. I think we're going to have a busy festival summer. They've just started booking so I have no idea where we'll play. We would love to play a UK festival. Festivalphoto: With so many members is it hard to avoid people coming down sick, particularly the singers? Chrigel: I do get sick - usually on every tour, but it usually doesnt affect my voice luckily. It's a whole other story for Anna. I think it's just your own responsibility to take care of your voice in the same way he has to take care of his drum kit. Festivalphoto: How are you enjoying the tour with Sabaton so far? Merlin: It's really relaxing. This is the seventh or eighth week and we're still getting along great.